ICECARATS DESIGNER JEWELRY 14K YELLOW GOLD BABY BAND RING SIZE 2.00Material Purity : 14KFeature : ChildrensManufacturing Process : CastedMaterial : GoldProduct Type : JewelryJewelry Type : RingsSold By Unit : EachMaterial Color : YellowRing Type : Baby & Children'sFeature 2 : SolidOUR MISSION & BELIEFSOur mission at IceCarats is to celebrate our customers and enhance their lives journey, honoring life's memorable occasions and enhancing the beauty of everyday through our extensive collection of quality jewelry.THE ICECARATS STORY - CRAFTSMANSHIP...QUALITY...VALUEJewelry is our passion - IceCarats is devoted to craftsmanship, quality, and value. Each piece hand stamped for authenticityMADE WITH LOVE FROM US TO YOU - QUALITY WITHOUT COMPROMISEWhen you purchase jewelry from the IceCarats collection, you buy with confidence - Lifetime Warranty and 30-Day Returns .ELEGANT GIFT PACKAGING - JUST ANOTHER REASON TO SAY YES!Receive Elegant Gift Packing On Every Order with IceCarats! 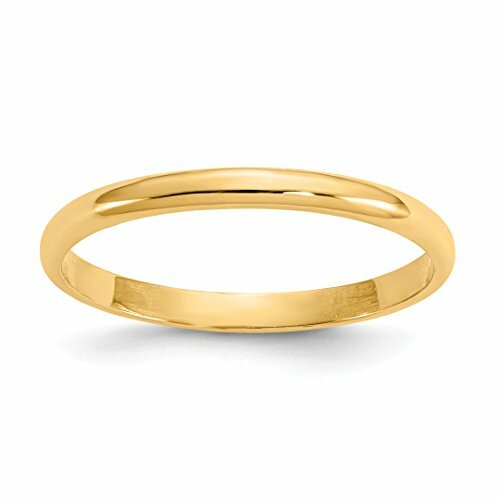 ICECARATS DESIGNER JEWELRY 14K YELLOW GOLD WEDDING RING BAND CHILDS RING SIZE 3.00Material Purity : 14KFeature : SolidManufacturing Process : CastedMaterial : GoldWidth : 1 mmProduct Type : JewelryJewelry Type : RingsSold By Unit : EachMaterial Color : YellowRing Type : Baby & Children'sOUR MISSION & BELIEFSOur mission at IceCarats is to celebrate our customers and enhance their lives journey, honoring life's memorable occasions and enhancing the beauty of everyday through our extensive collection of quality jewelry.THE ICECARATS STORY - CRAFTSMANSHIP...QUALITY...VALUEJewelry is our passion - IceCarats is devoted to craftsmanship, quality, and value. Each piece hand stamped for authenticityMADE WITH LOVE FROM US TO YOU - QUALITY WITHOUT COMPROMISEWhen you purchase jewelry from the IceCarats collection, you buy with confidence - Lifetime Warranty and 30-Day Returns .ELEGANT GIFT PACKAGING - JUST ANOTHER REASON TO SAY YES!Receive Elegant Gift Packing On Every Order with IceCarats! 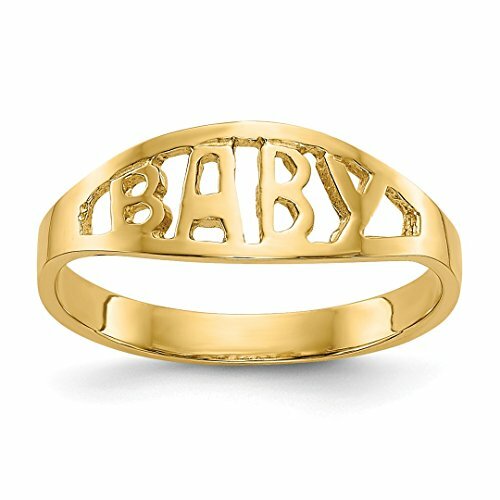 ICECARATS DESIGNER JEWELRY 14K YELLOW GOLD ANGEL DANGLE CHARM CHILDS BAND RING SIZE 4.75Material Purity : 14KSize (Minimum) : 2.75Size (Maximum) : 6.75Sizing Adjustment Increment : 0.25Material : GoldSizeable : YesWidth : 1 mmProduct Type : JewelryJewelry Type : RingsSold By Unit : EachMaterial Color : YellowRing Type : ThemedRing Top Length : 12 mmRing Top Width : 12 mmOUR MISSION & BELIEFSOur mission at IceCarats is to celebrate our customers and enhance their lives journey, honoring life's memorable occasions and enhancing the beauty of everyday through our extensive collection of quality jewelry.THE ICECARATS STORY - CRAFTSMANSHIP...QUALITY...VALUEJewelry is our passion - IceCarats is devoted to craftsmanship, quality, and value. Each piece hand stamped for authenticityMADE WITH LOVE FROM US TO YOU - QUALITY WITHOUT COMPROMISEWhen you purchase jewelry from the IceCarats collection, you buy with confidence - Lifetime Warranty and 30-Day Returns .ELEGANT GIFT PACKAGING - JUST ANOTHER REASON TO SAY YES!Receive Elegant Gift Packing On Every Order with IceCarats! ICECARATS DESIGNER JEWELRY 14K YELLOW GOLD OVAL BABY BAND RING SIZE 2.25Material Purity : 14KFeature : SolidManufacturing Process : CastedMaterial : GoldProduct Type : JewelryJewelry Type : RingsSold By Unit : EachMaterial Color : YellowRing Type : Baby & Children'sOUR MISSION & BELIEFSOur mission at IceCarats is to celebrate our customers and enhance their lives journey, honoring life's memorable occasions and enhancing the beauty of everyday through our extensive collection of quality jewelry.THE ICECARATS STORY - CRAFTSMANSHIP...QUALITY...VALUEJewelry is our passion - IceCarats is devoted to craftsmanship, quality, and value. Each piece hand stamped for authenticityMADE WITH LOVE FROM US TO YOU - QUALITY WITHOUT COMPROMISEWhen you purchase jewelry from the IceCarats collection, you buy with confidence - Lifetime Warranty and 30-Day Returns .ELEGANT GIFT PACKAGING - JUST ANOTHER REASON TO SAY YES!Receive Elegant Gift Packing On Every Order with IceCarats! ICECARATS DESIGNER JEWELRY 14K YELLOW GOLD HEART BABY BAND RING SIZE 2.00Material Purity : 14KFeature : ChildrensManufacturing Process : CastedMaterial : GoldProduct Type : JewelryJewelry Type : RingsSold By Unit : EachMaterial Color : YellowRing Type : Baby & Children'sFeature 2 : SolidOUR MISSION & BELIEFSOur mission at IceCarats is to celebrate our customers and enhance their lives journey, honoring life's memorable occasions and enhancing the beauty of everyday through our extensive collection of quality jewelry.THE ICECARATS STORY - CRAFTSMANSHIP...QUALITY...VALUEJewelry is our passion - IceCarats is devoted to craftsmanship, quality, and value. Each piece hand stamped for authenticityMADE WITH LOVE FROM US TO YOU - QUALITY WITHOUT COMPROMISEWhen you purchase jewelry from the IceCarats collection, you buy with confidence - Lifetime Warranty and 30-Day Returns .ELEGANT GIFT PACKAGING - JUST ANOTHER REASON TO SAY YES!Receive Elegant Gift Packing On Every Order with IceCarats! 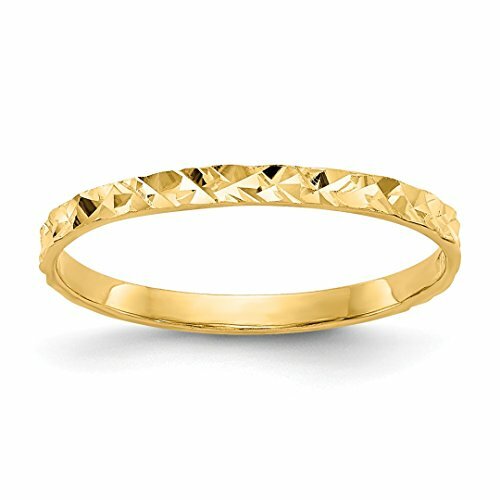 ICECARATS DESIGNER JEWELRY 14K YELLOW GOLD BABY BAND RING SIZE 1.50Material Purity : 14KFeature : SolidManufacturing Process : CastedMaterial : GoldWidth : 2 mmProduct Type : JewelryJewelry Type : RingsSold By Unit : EachMaterial Color : YellowRing Type : Baby & Children'sRing Top Length : 5 mmOUR MISSION & BELIEFSOur mission at IceCarats is to celebrate our customers and enhance their lives journey, honoring life's memorable occasions and enhancing the beauty of everyday through our extensive collection of quality jewelry.THE ICECARATS STORY - CRAFTSMANSHIP...QUALITY...VALUEJewelry is our passion - IceCarats is devoted to craftsmanship, quality, and value. Each piece hand stamped for authenticityMADE WITH LOVE FROM US TO YOU - QUALITY WITHOUT COMPROMISEWhen you purchase jewelry from the IceCarats collection, you buy with confidence - Lifetime Warranty and 30-Day Returns .ELEGANT GIFT PACKAGING - JUST ANOTHER REASON TO SAY YES!Receive Elegant Gift Packing On Every Order with IceCarats! 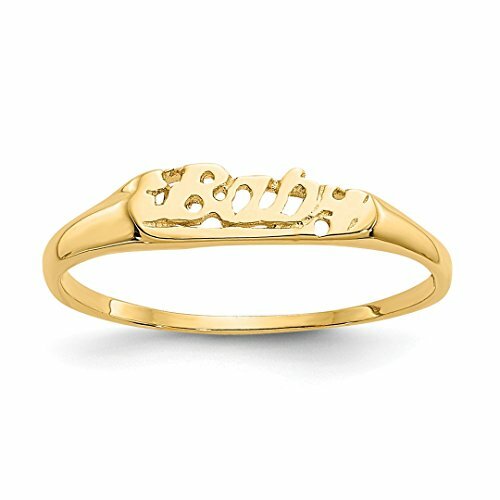 ICECARATS DESIGNER JEWELRY 14K YELLOW GOLD BABY BAND RING SIZE 3.00Material Purity : 14KFeature : SolidManufacturing Process : CastedMaterial : GoldWidth : 2 5 mm (tapered)Product Type : JewelryJewelry Type : RingsSold By Unit : EachMaterial Color : YellowRing Type : Baby & Children'sOUR MISSION & BELIEFSOur mission at IceCarats is to celebrate our customers and enhance their lives journey, honoring life's memorable occasions and enhancing the beauty of everyday through our extensive collection of quality jewelry.THE ICECARATS STORY - CRAFTSMANSHIP...QUALITY...VALUEJewelry is our passion - IceCarats is devoted to craftsmanship, quality, and value. Each piece hand stamped for authenticityMADE WITH LOVE FROM US TO YOU - QUALITY WITHOUT COMPROMISEWhen you purchase jewelry from the IceCarats collection, you buy with confidence - Lifetime Warranty and 30-Day Returns .ELEGANT GIFT PACKAGING - JUST ANOTHER REASON TO SAY YES!Receive Elegant Gift Packing On Every Order with IceCarats! 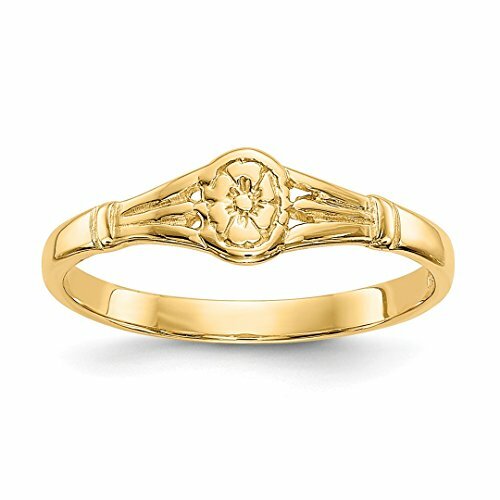 ICECARATS DESIGNER JEWELRY 14K YELLOW GOLD DESIGN WEDDING RING BAND CHILDS RING SIZE 3.00Material Purity : 14KFeature : SolidManufacturing Process : CastedMaterial : GoldWidth : 1 mmProduct Type : JewelryJewelry Type : RingsSold By Unit : EachMaterial Color : YellowRing Type : Baby & Children'sOUR MISSION & BELIEFSOur mission at IceCarats is to celebrate our customers and enhance their lives journey, honoring life's memorable occasions and enhancing the beauty of everyday through our extensive collection of quality jewelry.THE ICECARATS STORY - CRAFTSMANSHIP...QUALITY...VALUEJewelry is our passion - IceCarats is devoted to craftsmanship, quality, and value. Each piece hand stamped for authenticityMADE WITH LOVE FROM US TO YOU - QUALITY WITHOUT COMPROMISEWhen you purchase jewelry from the IceCarats collection, you buy with confidence - Lifetime Warranty and 30-Day Returns .ELEGANT GIFT PACKAGING - JUST ANOTHER REASON TO SAY YES!Receive Elegant Gift Packing On Every Order with IceCarats! 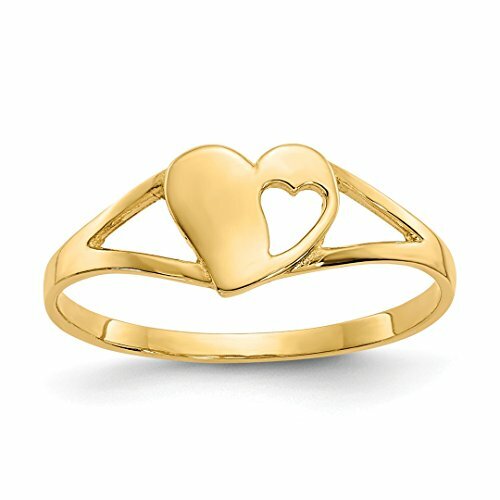 ICECARATS DESIGNER JEWELRY 14K YELLOW GOLD CHILDRENS HEART BAND RING SIZE 3.00Material Purity : 14KSize (Minimum) : 3.00Size (Maximum) : 3.00Feature : SolidManufacturing Process : CastedMaterial : GoldWidth : 2 mmEngravable : YesProduct Type : JewelryJewelry Type : RingsSold By Unit : EachMaterial Color : YellowRing Type : Baby & Children'sRing Top Length : 5 mmRing Top Width : 5 mmOUR MISSION & BELIEFSOur mission at IceCarats is to celebrate our customers and enhance their lives journey, honoring life's memorable occasions and enhancing the beauty of everyday through our extensive collection of quality jewelry.THE ICECARATS STORY - CRAFTSMANSHIP...QUALITY...VALUEJewelry is our passion - IceCarats is devoted to craftsmanship, quality, and value. Each piece hand stamped for authenticityMADE WITH LOVE FROM US TO YOU - QUALITY WITHOUT COMPROMISEWhen you purchase jewelry from the IceCarats collection, you buy with confidence - Lifetime Warranty and 30-Day Returns .ELEGANT GIFT PACKAGING - JUST ANOTHER REASON TO SAY YES!Receive Elegant Gift Packing On Every Order with IceCarats! 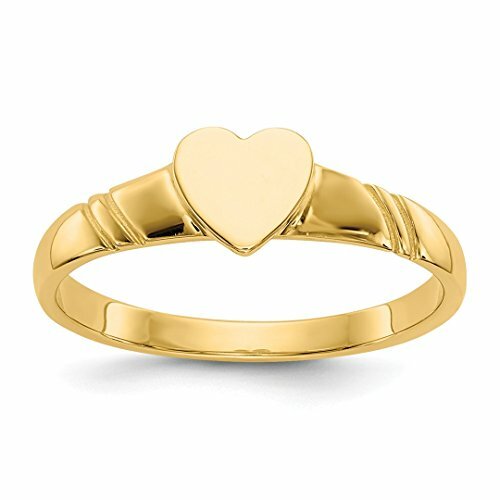 Color: 14k Yellow Gold Childrens Heart Band Ring Size 3. 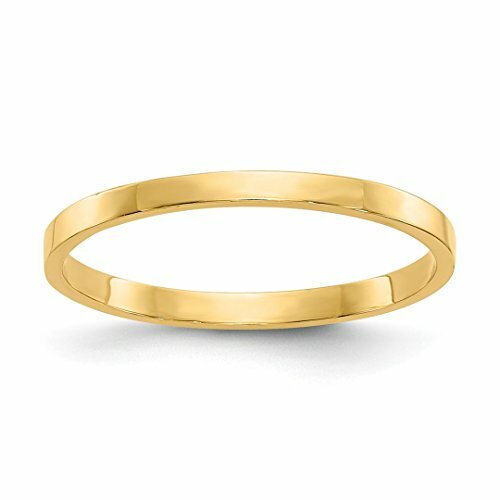 Compare prices on 14kt Yellow Gold Baby Band at Shopsimal.com – use promo codes and coupons for best offers and deals. We work hard to get you amazing deals and collect all avail hot offers online and represent it in one place for the customers. Now our visitors can leverage benefits of big brands and heavy discounts available for that day and for famous brands.